In the area of Gramvousa, there are about 400 recorded species of plants, including 26 endemic to Crete. Four of them are on the Red List of Threatened Plants of Greece and 25 are protected by Greek and European legislation. Three species are of particular interest as they cannot be found anywhere else in the world (stenoendemic species): a species of daisy called Anthemis glaberrima, a wild onion called Allium platakisii and Silene integripetala subsp.lidenii. 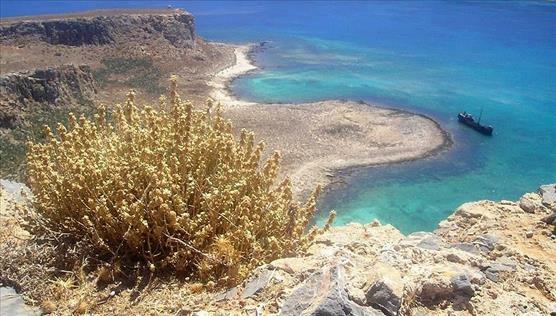 On the peninsula of Gramvousa the vegetation is considered monotonous and typical Mediterranean shrub species dominate the area, such as Sarcopoterium spinosum, thyme (Coridothymus capitatus), Calicotome villosa and ladania (Cistus creticus). We can also find shrub types of mastic tree (Pistacia lentiscus) and carob (Ceratonia siliqua). 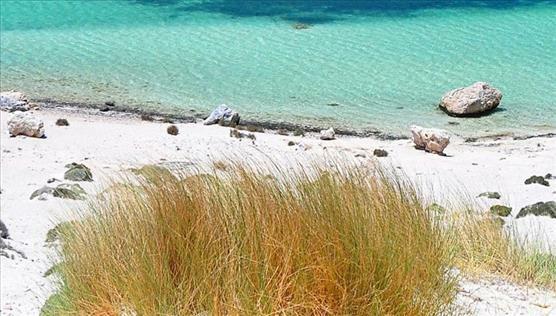 In the sandy beach of Balos, we find another type of vegetation. It is interesting to see the impressive forms and shapes of shrubs such as Erica manipuliflora, Genista acanthoclada, thyme (Coridothymus capitatus), and Pistacia lentiscus, which they get while trying to cope with the difficult ecological conditions in the area, such as strong northerly winds and the natural instability of the dunes. Here we find typical ammophilous species such as Medicago marina, small carrot (Pseudorlaya pumila), Hyoseris lucida, sea daffodill (Pancratium maritimum), beachgrass (Ammophila arenaria) and the protected Centaurea pumilio. All of them help the sand dunes to maintain their shape. On the steep rocky shores and the scattered cliffs of the peninsula of Gramvousa we see a different kind of vegetation. Here we find many rare and endemic species such as Inula candida, silvery Centaurea argentea, Scrophularia heterophylla, the Cretan ebony (Ebenus cretica), and protected species such as the tulip (Tulipa saxatilis subsp Saxatilis), the Cretan dittany (Origanum dictamnus) and a kind of wild onion (Alliym circinatum). On the islands of Imeri and Agria Gramvousa there are 173 and 119 recorded plant species respectively. Among them is a species found only on these islets: a kind of daisy that blossoms in the spring called Anthemis glaberrima. This, together with a lily found in Imeri Gramvousa and called Androcymbium rechingeri, are protected by Greek and European legislation. In the wider underwater area, at depths that can be reached by the sun, there are formations or “meadows”of Posidonia oceanica, a seagrass species that is endemic to the Mediterranean. The existence of Posidonia oceanica indicates clean waters and provides a shelter to many species of fish.